When was the last time you drove over 600 miles without making a fuel stop? Was it never? Yeah, I thought so. I know my car does 300-350 miles on a single tank, but driving a vehicle that can do more than double that still boggles the mind. Yet, that’s where the joy of driving a hybrid comes in. The word hybrid still has some stigma attached to it, with many people’s go-to example being the Toyota Prius. While the Prius’ impact on the hybrid market is not to be sniffed at – it’s the car that kick-started the shift - it’s not the most desirable car outside the world of Hollywood celebs desperate to increase their rep with Greenpeace and Friends of the Earth. It’s also not much of a looker, but hybrid life doesn’t have to be like this. Enter the Lexus RC 300h, which pairs a V6 engine with an electric EV motor while also sporting some rather dashing design. A tired, run-of-the-mill car this is not, and from a glance you wouldn’t know it was a hybrid. It does say the word on the side skirts, but other than that people on the street are ogling what they believe is a gas-guzzling, rain-forest destroying sports car as you drive by. Sliding into the low-set, yet comfy, driving seat there’s no question you’re getting into a performance car, and the analogue clock (yep, they do still exist) tells you this is a Lexus and not a car from an inferior brand. Style is temporary, class is permanent people. Push the Start/Stop button and the petrol V6 engine comes to life, and the digital dashboard and screen on the center console wake up. Shift the automatic gearbox into drive (or reverse) and, if you’re near other cars, the parking sensors will start chirping at you. In fact, I found them to be a little over enthusiastic, but thankfully there’s a button down to the right of the steering wheel allowing you to turn them off – which is certainly helpful if you’re in traffic and are a little close to the car in front. Acceleration is smooth, although not as instantaneous as it could be thanks to a little bit of lag between pedal and forward momentum – it’s not enough to leave you high and dry at a junction, and after a while you get accustomed to its working. So far, so good then – but EV action was little to none during my first half hour or so behind the wheel. The electric motor kicks in when you’re crawling along in traffic, stopped at traffic junctions and under braking, with the latter charging the battery that powers it. There’s no need to plug the RC 300h in to top up the battery, as it’ll charge itself thanks to the wonders of kinetic energy when you brake. That means that you won’t be burning any fuel when EV mode is activated – denoted by a green car icon with the letters in it on your dash – allowing your gas tank to last you longer. 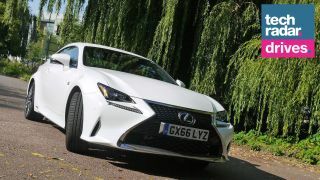 When we got into the RC 300h for the first time and turned on the engine, it proudly displayed that we have over 620 miles until we’d need to visit a forecourt – which was certainly music to our cash-strapped ears. That said, with the RC 300h starting at £37,145 the car itself is out of my price range currently, but if you can afford it you can benefit from the extended range as well as the ego-boosting fact that you won’t be polluting the world as much. If you select ‘Car’ on the main screen in the center console you can even see what energy you’re using (and creating under braking) as the RC 300h switches between its petrol and electric engines. It’s not overly detailed, but it’s an easy to understand animation. What’s also clever is the option on a full EV mode, with a button to the left of the gear shift. This will only work when the battery has enough charge (which you can see in the aforementioned Car screen), and over short distances at low speeds. If you’re stuck in a slow traffic jam, this would be an ideal time to turn it on as it will save the car from burning any fuel as you crawl along and sit idle. Get a little too heavy on the throttle, however, and you’ll be return to the normal mode. A novel addition to the Lexus RC 300h – analogue clock aside – is what looks like a ‘90s laptop trackpad below the gear shift. And that’s basically what it is. Unlike other cars which offer touchscreens, the RC 300h is still stuck a little in the past in this particular area. I'll admit I was a little skeptical when I first laid eyes on it, but the trackpad works surprisingly well. It’s also one big button, which makes selecting options on-screen all the more easy – although I’d have still preferred a touchscreen. The big thing with the Lexus RC 300h for me though is the extend range thanks to the hybrid engine. I drove over 200 miles during my time with it and when it came to handing it back there was still several hundred miles left in it. Hybrids are game-changing, and the Lexus RC 300h manages to save the world while looking fantastic. More of this please.